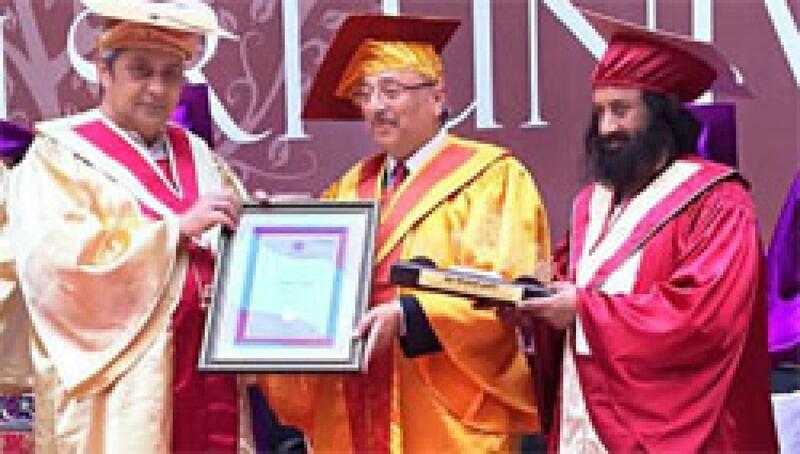 Mahesh Gupta, founder Chairman of Kent RO Systems Limited received an honorary doctorate at the 2nd Convocation of Sri Sri University Orissa. Mr. Gupta was conferred with the PHD Degree (Honoris Causa) by Hon’ ble Chief Minister of Orissa Shri Naveen Patnaik in the presence of his holiness Sri Ravishankar ji for his exemplarily work he has done in the field of water purification for urban as well as rural population. The university appreciated the inspirational leadership of Shri Gupta and commended his pioneering strategies which have been fundamental to the rapid growth and unprecedented success in the field of safe drinking water for everyone. Highlighting the importance of the blend of professional training and spiritual practice, world renowned spiritual leader as well as architect of the globally popular Art of Living Sri Sri Ravi Shankar (while gracing the second convocation of Cuttack-based India’s new age Sri Sri University) exhorted the brilliant alumni to take this Karmayogi spirit to their respective workplaces. 60 years old Mr. Gupta is known as the pure waterman of country for his significant contribution in brining safe drinking water to every household. He is currently Senior Vice President at PHD Chamber of Commerce and Industry. Mr. Gupta is an alumnus of IIT Kanpur and IIPM Dehradoon.